Review: TAMUSIC has been well-recognized from the doujin community as being one of the few groups that have set music from games (notably Key visual novels and Touhou shooters) to violin and piano. Although I enjoy piano and violin pieces, I am continually disappointed by TAMUSIC’s arrangements because their works have a tendency to be above average at best and soulless at worst. The chief problem lies in their music which lacks creativity and tends to be loaded with superfluous flourishes, and usually ends up leaving me disappointed. So when I heard that TAMUSIC had released an album with music from The Melancholy of Haruhi Suzumiya, I was morbidly curious to see how this one would turn out. I had braced myself for the usual TAMUSIC material, and while they managed to exceed my low expectations, it wasn’t by a whole lot. The first track is an arrangement of the ever-popular “Hare Hare Yukai,” which sounds energetic because the violin does a pretty decent job of capturing the feel of the original without deviating too much from the source material. Next up is their rendition of “Koi no Mikuru Densetsu” which starts off pleasantly with a very smooth violin introduction before they get into the heart of the actual song itself around 0:40. Like “Hare Hare Yukai,” this piece also sticks closely to the original and is generally a pleasant listen save for the segment around 1:39 – 1:45 where the harmony is over-emphasized, creating a rather jarring effect. TAMUSIC’s arrangement of “God Knows…” doesn’t try to take too many liberties with the original (see a pattern yet? ), leaving us with a straight transcription. While it’s mostly enjoyable, the piece begins to unravel around 1:09. Most of the blame can be placed on their attempt at putting two violins together, which makes the piece all the worse because the melody is discordant, making it grating to the ears. The music still keeps its core base, but TAMUSIC’s inability to have the two violins complement each other leads to this piece’s undoing, taking an above average effort down a few notches. Unfortunately, “God Knows…” is only the first in the series of pieces that would bring this album’s rating down. “Bokuen Desho, Desho?’s” melody feels utterly uninspired because the music feels empty in a way that the energetic original piece never was. Instead it introduces flaws in its harmony and counterpoint, which range from being too chaotic at times to overpowering the melody completely at other times. The follow-up, “Lost My Music,” continues with the emotionally void feeling because the arrangers seem to have given up and resorted to copying the original note for note. Although this effort yielded a pleasant refrain from the two violins, the rest of the piece lacks substance and sounds far worse than the original. This finally brings us to the last three pieces, which are a second take on the three pieces this album started with. And all of them have taken a turn for the worse. “God Knows…” becomes much more melancholy before going in with the second stanza that feels really heavy and soporific as it just drones on and on. “Koi no Mikuru Densetsu’s” 2nd version has shoddy harmony and ends rather poorly because the music just gets dragged out to the point where the last 30 seconds felt more like 30 minutes. With this sort of downfall, a good piece is practically required to close out the album and they almost succeeded through a light-hearted version of “Hare Hare Yukai” that nonetheless shocked me by being completely soulless. How a song filled with joy can be reduced to this sorry state is anyone’s guess. In light of this, it’s evident that listening to TAMUSIC’s works is a frustrating exercise because violin and piano arrangements of anime music can be done, and done well. The Aria piano albums have proved that much, so to see such a mediocre effort is always going to be disheartening. The fact that they get positive recognition is a shame, and only leads me to ponder just how bad the other groups are if TAMUSIC is considered good. Granted, I haven’t listened to a lot of other doujin groups who’ve done anime works, but the Western doujin scene (conveniently located here) has produced consistently better quality music despite having a smaller body of work. As an example of a good remix, try checking out Dale North’s hauntingly beautiful arrangement of Witch Hunter Robin’s music. When all is said and done, I probably hold the minority opinion here and that people do see something great from TAMUSIC’s works that I’m just not “getting.” But I cannot see past their soulless arrangements devoid of creativity. To be great, arrangements have to be more than just transcriptions from one instrument to another. 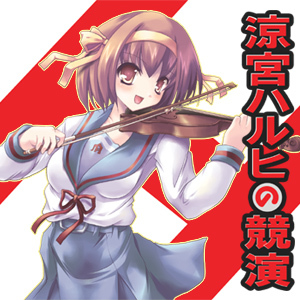 So for those who share my opinions on music, give this album a pass unless you insist on getting your hands on any and all Haruhi-related doujin works or if you really need a quick fix for some anime violin arrangements, regardless of how good or bad they are. to be honest, when I went to youtube and found TAMUSIC covering Nagisa’s theme from the CLANNAD game (essentially Dango Daikazoku, as we all know), I was puzzled at why he was being praised so much. He did play well, I’d admit that but all he was doing was just playing the transcription. I can do that on guitar and I am 100% sure that I won’t be praised the way he – playing a violin – would get praised. He moved a lot and all and I don’t know about ‘soul’ in playing the violin but admittedly I was never really wowed. In pale comparison to that, a cover of the same piece by a doujin group with violins and piano impressed me by quite a lot and instead of playing the exact same melodies (guess what) they played differently to accompany the soft and touching tune of Nagisa. In that comments page of the TAMUSIC cover, I was the sole person who commented the lack of creativity, also noting that since a lot of people seem to be praising you (TAM), I’m probably disillusioned. Of course I read this post a long while back before seeing that youtube video but now I am very hopeful that I wasn’t the only guy to think that their blandness was completely awful. Even =Neutral=, an acoustic doujin group, strayed off the original tune of some songs, i.e The Primal Scene of Japan The Girl Saw while TAM is like a carbon copy of Nagisa. Ah and I heard your 3 samplers. Not what I would keep in my music library to be honest. But yeah, I do hope that more people come to realize just why TAM is so awful. Also agreed that this stuff should not stick around one’s music library unless they just want the novelty of it. Beyond that, there’s no great listening value lost if you shut TAM out from your music listening repertoire.